The team of Francesca Ferlaino, University of Innsbruck, discovered that even simple systems, such as neutral atoms, can possess chaotic behavior, which can be revealed using the tools of quantum mechanics. The ground-breaking research, published in the journal Nature, opens up new avenues to observe the interaction between quantum particles. The team of Francesca Ferlaino, Institute for Experimental Physics of the University of Innsbruck, Austria, has experimentally shown chaotic behavior of particles in a quantum gas. “For the first time we have been able to observe quantum chaos in the scattering behavior of ultracold atoms,” says an excited Ferlaino. The physicists used random matrix theory to confirm their results, thus asserting the universal character of this statistical theory. Nobel laureate Eugene Wigner formulated random matrix theory to describe complex systems in the 1950s. Although interactions between neutrons with atomic nuclei were not well-known then, Wigner was able to reliably predict properties of complex spectra by using random matrices. Today random matrix theory is applied broadly not only in physics but also in number theory, wireless information technology and risk management models in finance to name only a few fields of application. In the Bohigas-Giannoni-Schmit conjecture random matrix theory has been connected to chaotic behavior in quantum mechanical systems. Catalan physicist Oriol Bohigas, who passed away last year, can be considered the father of quantum chaos research. 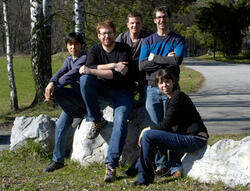 From left: Kiyotaka Aikawa, Albert Frisch, Simon Baier, Michael Mark and Francesca Ferlaino (Photo: Erbium Team). The experiment and statistical analysis were carried out at the Institute for Experimental Physics at the University of Innsbruck. Theoretical support was provided by John L. Bohn from the Joint Institute for Laboratory Astrophysics in Boulder, Colorado, USA and the team of Svetlana Kotochigova at Temple University in Philadelphia, Pennsylvania, USA. The Austrian researchers are supported by the Austrian Science Fund FWF and the European Research Council (ERC).